This sacrosanct journey to Yamunotri starts from Barkot. This whole Yatra comprise many tourist attractions. Here is the complete itinerary, which a tourist has to carry out on his trip, along with some major attractions that he may cherish. For undertaking this holy expedition, one has to reach Barkot. It can be reached easily by road from Haridwar/Dehradun. Thus, one can reach Haridwar/Dehradun by train or by car, Haridwar/Dehradun, and can then proceed to Barkot by road. Barkot: Situated around 49 kilometers from Yamunotri, acts as a base camp for Yamunotri. It is a great place to enjoy adventure activities as well, since there are many trekking excursions offered by this destination. The fascinating panoramas, sacred flow of Yamuna and apple orchards make the travelers amazed. From here, proceed towards Yamunotri Shrine. One the way, pilgrims will witness the extreme spirituality in Hanuman Chatti. Hanuman Chatti: Situated on the confluence of Yamuna and Hanuman Ganga Rivers, Hanuman Chatti is an ideal place for relishing the beauty of nature. It comes on the trekking route to Dodital and Darwa Top. This serene spot is located at the distance of 13 Kilometers from Yamunotri Shrine. On moving forward, a tourist may visit Janki Chatti, which is another significant pilgrimage center for Hindu Devotees. Janki Chatti is the inevitable element of Yamunotri Route. Palanquins and ponies are available from this point to Yamunotri. This spot is renowned for its hot water springs and includes the last village in the area. The journey then takes to the prime destination Yamunotri Shrine. At this sacred point, one can also visit the attractions like Saptrishi Kund, Surya Kund and Divya Shila. Saptrishi Kund: Saptrishi Kund is located at the distance of 10 kilometers from Yamunotri and is blessed with azure water and slushy snow. According to Hindu Mythology, sever great Rishis (saints) Atri, Kashyapa, Vasistha, Bharadwaj, Gautama, Visvamitra and Jamadagni performed penance at this lake for long time in primordial era. Surya Kund: Surya Kund is the most significant thermal spring near Yamunotri Shrine. Surya Kund’s temperature is about 88 degree Celsius. The occurrence of this thermal spring encircled by snow-covered mountain crests enhances to the great feel of the place. Moreover, a unique thing about this thermal water spring is that one can boil rice and potato in this Kund, which they can take home as prasadam. Divya Shila: Divya Shila is a strong rock pillar situate near Surya Kund. Before entering to Yamunotri Shrine, devotees offer Puja at this Shila. Although the journey on this rock is bit tiresome, this rewarding voyage endows pilgrims with utter serenity and calmness of soul. After visiting these sacred points, the devotees then return back to Barkot. The pilgrim has now to move towards Uttarkashi from Barkot in order to reach Gangotri Shrine. Uttarkashi is the holy town set on the banks of Bhagirathi River at an elevation of 1158 meters. Its significance among Hindus is no less than Kashi. In Uttarkashi one can visit sacred Vishwanath Temple. Vishwanath Temple is dedicated to Lord Shiva and embraces the great trident or Trishul of Lord Shiva. This trident is made of eight imperative metals. According to Hindu Mythology, Lord Shiva slaughtered Vakasur with his Trishul at this sacred place. Moreover, Uttarkashi is also an apt destination for adventure fanatics. With NIM (Nehru Institute of Mountaineering), Uttarkashi offers in-depth training to all those who want to conquer heights. This institute is regarded as one of the most prestigious mountaineering institutes of India. From Uttarkashi one has to move towards Gangotri. In between the route, some major attractions can be visited. These attractions incorporate Gangnani, Bhairon Ghati and Harsil. Gangnani (Hot water spring): Gangnani is a hot water spring located at a distance of around 46 kilometers from Gangotri shrine. It is an engrossing destination for the devotees seeking tranquility of mind. The hot water spring here is known as Rishikund and it is believed to be necessary to take a dip here before embarking towards Gangotri. Bhairon Ghati: Situated close to the confluence of Bhagirathi River and Jat Ganga, Bhairon Ghati is a scenic place 10 kilometers from Gangotri. There is a Bhairon Nath Temple here, which is cosseted by lush forests. One can reach Bhairon Ghati by crossing Jahanvi River and then moving uphill. Harsil: is the virgin and pristine jewel of Uttarakhand. It offers ample of sightseeing opportunities to tourists seeking tranquility. Spouting flow of River Bhagirathi, salubrious environment, peaceful ambiance and twittering of birds are the prime attractions of this region. Submerged Shivling is made of natural rock, which is submerged under water. It is an enticing tourist destination. This Shivling can be easily observed by devotees during winters as the water level goes down during this time. As per the Hindu mythologies, Lord Shiva received Ganga in his hair at this place. Gomukh Glacier is the source of River Ganges. It is a scenic spot. It resembles to the face of a cow and hence known as Gomukh. It is believed that the trek to Gangotri is incomplete without taking a bath at this glacier. The spot is extremely astounding and hordes of tourists swarm it every year. Bhagirath Shila is a holy place where the great sage Bhagirath carried out a long term penance to bring Ganga on the earth. Thus, this place holds a great important among Hindus. The platform, on which Bhagirath sat, is still present here. After having a plunge into ultimate spiritual sense in Gangotri Shrine, the pilgrim has to return Uttarkashi in order to proceed towards Kedarnath. 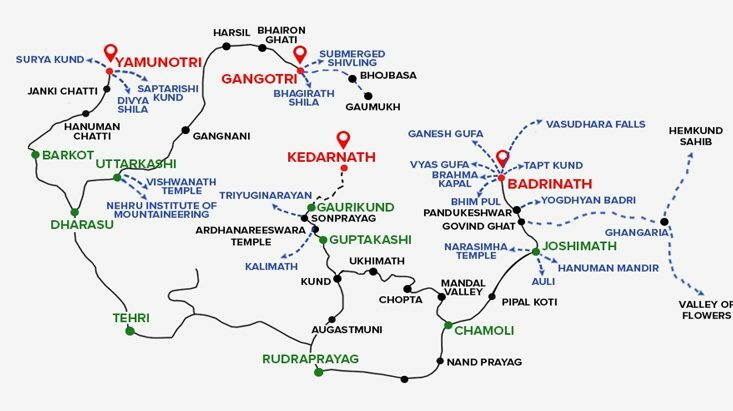 Moving from Uttarkashi towards Kedarnath, one can explore the attractions like Kalimath Temple, Guptkashi, and Ardhanareeshwar Temple which comes on the route to Kedarnath. Kalimath is one of the most renowned temples with traditional and cultural significance. It is dedicated to Goddess kali and positioned at an astonishing elevation of 6000 feet. The holy river Saraswati touches this temple and interestingly there is no idol of Goddess kali here. There is just a silver plate, which is revered as homage to Goddess Kali. Guptkashi is located at a distance of 47 kilometers from Kedarnath. This religiously significant town is on the western side of Mandakini River. The trek to Kedarnath commences here. This town boasts sacrosanct Ardhanarishwara Temple. Ardhanarishwara Temple is dedicated to Lord Shiva and includes the idol in which Lord Shiva is depicted in half-female and half-male form. The route, on moving further, reaches to holiest shrine of Lord Shiva- Kedarnath. After visiting Kedarnath, the devotee has to return Guptkashi. In the midst of route, if time allows, one can go to explore Sonprayag, Triyuginarayan and, Gaurikund which comes on the way to Guptkashi. Sonprayag: Sonprayag is a sacred spot located at an altitude of 1829 meters on the route to Kedarnath. Positioned at the confluence of Mandakini and Basuki rivers, Sonprayag holds an immense importance in Hinduism. It is believed that one can attain emancipation by taking a dip in the holy water of this sacred spot. Triyuginarayan: This temple is believed to be even older than the holy Kedarnath Shrine. It is located a few kilometers away from Sonprayag. There is a fire that is kept alive here. It is said that the ‘Phere’ of the Lord Shiva and Goddess Parvati took place around this consecrated fire. The arti conducted here is a unique point of attraction for the devotees on the way to Kedarnath. Gaurikund has a great significance among the devotees of Lord Shiva. As per the mythological beliefs of Hindus, it is the place where wife of Lord Shiva- Goddess Parvati, carried out penance to win over the heart of Lord Shiva. Gaurikund is located at an altitude of 1982 meters. After reaching Guptkashi, the pilgrim can move his waist towards witnessing holy Badrinath Shrine. In order to soak the soul in the divinity of Badrinath, one has to reach Pipalkoti. It is the first halts of the route. Here, a devotee and nature lover can admire the spellbinding sites of Chopta meadow and Mandal Valley. Chopta is also known as mini Switzerland of Garhwal. It is the starting point of trek to Tungnath. It offers arresting vistas of imposing Himalayan range comprising Chaukhamba, Nanda Devi and Trishul. Mandal Valley is a beautiful valley located on the route to Pipalkoti. It is a picturesque spot to get dipped into gorgeous beauty of nature and to rejoice the scenic vistas. On the way from Pipalkoti to Badrinath, there are many tourist attractions that a devotee can savor. These attractions include Joshimath, Hanuman temple, Narshingha Temple, Yogdhyan Badri at Pandukeshar. Joshimath is a famous hill station as well as revered pilgrimage destination. This town is also named as Jyotrimath. The sacred rivers Dhauliganga and Alaknanda meet just below the Joshimath. Narshigha Temple of Joshimath is dedicated to Lord Vishnu. This temple is almost 1200 years old. A unique point about this temple is that at the commencement of winters, the Badrinath deity is bought here in a procession. This idol is then kept in Narshingha Temple for the period of six months. Yog Dhyan Badri at Pandukeshar: Yog Dhyan Badri is a sacrosanct temple located in Pandukeshwar. Pandukeshwar is the place where King Pandu, the father of the Pandavas, did meditation. There are three idols placed in the temple. These idols are of Lord Vishnu, Madri and Goddess Laxmi. It is believed that Lord Indra presented the idol of Lord Vishnu to Arjuna after being pleased by his meditations. The pilgrim, on moving forward, reaches to holy Badrinath Shrine. At Badrinath, other than the auspicious idol of Badrinath, one can also visit the other sacred and spectacular charms like Tat Kund, Brahma Kapal, Narad Kund, Bheem Pul, Vyasa Gufa and Ganesh Gufa. Tapt Kund is a thermal water spring well known for its healing traits. This kund is believed to be the abode spot for Lord Agni. According to Hindu Beliefs, it is important to have a plunge into Tapt Kund before proceeding towards Badrinath Shrine. Brahma Kapal is sacred spot in Badrinath. It is a flat base situated on the bank of Alaknanda River. At this place, the devotees pay homage to the souls of their ancestors. It is positioned at a distance of 100 meters in the northern direction of Badrinath Shrine. Another vital religious spot in Badrinath, Narada Kund is situated near the Tapt Kund. As per the Hindu Beliefs, it is the place where the great saint Narada Muni wrote Narada Sutras. Narada Kund is covered by a rock that relucts the flow of water. Bheem Pul, located opposite to Vyasa Gufa, is an enormous rock which serves as natural pathway across the river Saraswati. It is said that Bheem, who was one of the five Pandava brothers, threw a splendid rock in order to make a bridge so that Draupadi could walk over it easily. Ganesh Gufa and Vyasa Gufa are two sacred caves in Badrinath. In Vyasa Gufa, according to beliefs, the great sage Vyasa used to sit. In Ganesh Gufa, Vyasa used to dictate Mahabharata to Lord Ganesha. From Badrinath, after cleaning the soul by carrying out holy trip to Chardham, the tourist has to move towards Rishikesh in order to go Delhi. On the way one can relish the panoramic places like Rudraprayag and Devprayag. Rudraprayag is at the confluence of two sacred rivers Mandakini and Alaknanda. It is one of the five confluences of Alaknanda known as Panch Prayags. This renowned town offers the scintillating panoramas to the tourists. Devprayag is also among the Panch Prayags and embraces the confluence of Bhagirathi and Alaknanda Rivers. This town is located on Badrinath-Rishikesh Highway. Devprayag is the seat of the priests of Badrinath shrine. Now, moving the feet forward towards Rishikesh, the devotees can cater paramount tranquility to the soul and body by carrying out Yoga. This town is known as the ‘Yoga capital of India’ and ‘World Capital of Yoga’. There are several Yoga Ashrams in Rishikesh, such as Parmarth Niketan, Sivananda Ashram, Sadhna Mandir, Sanskriti Yogpeeth, etc. Here, a tourist can learn different Yoga asanas under expert guidance of Gurus. After having a rejuvenating Yoga experience in Rishikesh, the tourist can arrive to Delhi in order to return back home. The above-mentioned places do not require any special effort or time during the Chardham Yatra. Thus, it can be said that these spots are something that a tourist must not miss. This sacrosanct trip to Chardham, along with other attractions enroute, makes certain that a devotee can wash away all his sins and go back with a bag full of lifelong memories!